Hollywood has made a habit of reappropriating myths and fairytales, setting about debunking and demystifying them for modern audiences. 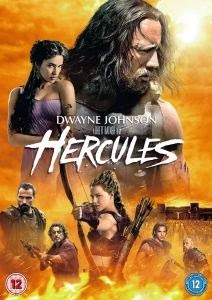 The latest such icon to undergo this particular treatment of refinement is the son of Zeus himself, the mighty Hercules (2014). Dwayne Johnson might ably fill the demigod’s armour but the story labours to fill in the man behind the legend, putting a tired modern twist on his famous adventures. Based on a graphic novel by comics scribe Steve Moore, this is an attempt to ground the character in historical epic. Sadly, director Brett Ratner actually devalues one of the most enduring of heroes, turning a potential fun fantasy thrill ride into homogeneous rubbish. The scene is set by Iolaus (Reece Ritchie), who recounts several of Hercules’ daring deeds to a band of pirates holding him captive. Flashbacks convey battles with the Lernaean Hydra, the Erymanthean Boar and the Nemean Lion – and these are the film’s high points, enormous beasties succumbing to the power of their adversary. When Herc arrives to rescue Iolaus, the revisionist angle is quickly revealed – the heavyweight actually has a covert team behind him who, between them, have helped to create the illusion of a legend. In it for the cash, they venture to Thrace to help Lord Cotys (John Hurt) to defend against marauding invaders. Yet things are not entirely what they seem. Of course, things are exactly as they seem, and any attempts at narrative skulduggery are signposted from leagues away. That pitch is present from the outset. The opening introduces Herc as “son of Zeus – the Zeus!” The real problems lie in the stripping away of the façade and Hercules and his band of rogues (of which Rufus Sewell and Ian McShane are the pick) exposure as charlatans. The magic innate in the character is syphoned away as it slowly dawns on the audience that they will not get the gargantuan finale worthy of such an exalted champion. Equally, the film never has as much fun as one might desire either from Hercules or from the star. Johnson is perfectly cast as the hulking bruiser – he does, at least, hit things very hard and lift things very heavy – but he’s muted, the material never offering him a chance to shine. Hercules is regularly portrayed in literature as a drunken, bawdy oaf, which would have seemed an ideal avenue to go down in this alternative narrative. It would have provided the audience with something new, afforded the character some kind of trajectory, and allowed Johnson to employ his considerable comic talents. This, however, is played entirely straight. Herc may be strong, but he is just a man – shaped not by history, myth or the character’s lineage, but by the stale aesthetic of modern action cinema. He could have been a contender. It could at least have been a fun romp. Instead, Ratner’s Hercules casts off the compelling tales that have lasted millennia and takes the son of Zeus from hero to zero. This review was originally published for theatrical release on 24 July 2014.